Life and Breath Photography - Who Knows Your Name? It is not easy living in a world obsessed with glory. 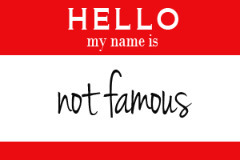 Reality Tv, You Tube, Internet Blogs, and Social Media have created this belief that you can be famous for something. If you can create a viral video, popular blog, get on a reality show or get a lot of followers through some sort of social media, you will be famous. You will have achieved something. You will get the notoriety that you desire. I fall in that trap sometimes, myself. I tell myself that if I create a popular blog, someone will notice and then they will ask me to write a bible study, or speak at an event, or offer me a job. And then I beat myself up when I don't have time to write a blog entry and thus keep me from achieving fame! And then I start to resent the things that keep from this fame - the dishes, the laundry, my kids, my hubby. The ironic part is that I am totally happy with my life and everything in it! Its only when I start thinking that I need to be more famous than I am in order to be successful. Do you know who has won the most Grammys of all time? Who is Sir Georg Solti? He was an orchestra and operatic conductor who earned 31 Grammys in his lifetime.1 He died in 1997, but served as the music director of the Chicago Symphony Orchestra for many years. He was nominated 74 times for his work, yet he only won 31. His success record was less than 50% at the Grammys! What is so interesting to me, though, is that most people have never even heard of him. In a world where people like Kim Kardashian are more famous for their name, than what they've done, its hard to imagine someone who is as successful as Sir Georg Solti not being a household name. Yet there are so many people who have done extraordinary things and no one knows their names. There are missionaries in closed countries who have shared the gospel to thousands and yet no one will ever know their name. There are people in your community that everyday do unspoken acts of glory and no one knows their names. There are moms, who on a daily basis, do tasks (like laundry!) that no one will ever give them an award for or list their names among the famous. Yet success cannot and should not be defined by who knows your name. He has redeemed us. He knows us by name. Even when no one else knows our name or what we've done (good and bad)! While this isn't always easy, it is a promise that we cling to. What does the Bible say about names? In the Bible, a person's name was important, not because of who knew it, but because of what it meant. Abraham, which means "He laughs," signified the laughter that Abraham and Sarah both had when God told them they would have a son in their later years.3 (He was 100 and she was 90 AND had already gone through menopause. Being pregnant at 90 is NO laughing matter, that's for sure!!) The name Jesus, means "Savior," because he was the Savior of the world. Naomi, after losing her husband and two sons, wanted to change her name from Naomi, which meant "pleasant," to Mara, which meant "bitter."